Allows a choice between two signal sources, such as Cable TV or Antenna, with the flip of a switch. Gold for quality construction. 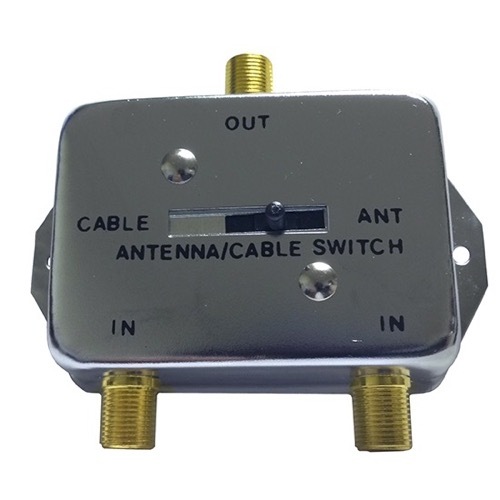 Use 75 Ohm coaxial cable with "F" connectors to connect output marked "TV SET" on A/B Switch, to VHF "Input" on TV. Connect 75 Ohm cable from Cable TV box or VCR to "Input" on "Cable" side of A/B Switch. Connect antenna lead to "Input" on "Antenna" side of A/B Switch. By moving switch to "Cable" you can watch Cable TV or in case of VCR you can watch the VCR. By moving the switch to "Antenna" you can use the antenna in case Cable service is interrupted or in case of a VCR, you wish to watch from your antenna while recording different show from cable.